OhGizmo Review – Phlash | OhGizmo! In terms of image size and quality cameraphones are slowly catching up to their point & shoot brothers. One of their obvious benefits is that most people always have their phone in easy reach which makes grabbing a quick photo a cinch. Of course there are still some major disadvantages to relying on a cameraphone for all your photographic needs. While a lot of newer phones are starting to incorporate flashes the majority of camera-equipped phones already out there do not, which usually results in some pretty poor pictures. This is where the Phlash Universal Cameraphone Flash comes in, providing that extra bit of desperately needed light when a flash is not available. Ok, so you’re one of those persons who does enjoy reading reviews. Either that or you have a bit of time to kill. I’ll admit when I first saw the Phlash when it was announced online a month or so ago I thought it looked kind of big to be carried around in your pocket in addition to your phone. (I’m definitely a pocket-minimalist.) However when the Phlash arrived it was definitely a lot smaller than I had originally thought. And after using the Phlash for a few weeks I can definitely say its size is not a problem at all. 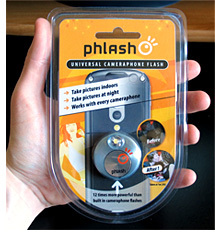 The Phlash comes packaged in what looks like a standard plastic blister pack. While this packaging does a great job at showing off the product we all know they can often be a huge pain to open. As I was reaching for my trusty scissors to start the opening procedure I was quite happy to find the packaging was not actually sealed around the edges. Instead it opens like a book, with a plastic hinge on the right side. This also allows the packaging to be easily closed and sealed again if needed. Inside you’ll simply find the Phlash unit itself, a short lanyard and a printed cardboard insert. Attached to the back of the insert is a removeable 3M sticker that is exactly sized to the Phlash unit itself. 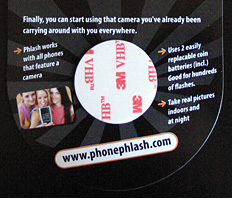 To make it easier to always have the light pointed in the same direction as your cameraphone lens you can attach the Phlash directly to your phone using this sticker. I opted not to test how well the sticker works since I don’t want the added size (though minimal) of the Phlash added to my nice thin Razr. Also from my experience most stickers, especially those that have been stuck for a while are usually far from easily removed and may leave a residue behind. Like I mentioned earlier I was happy to see that the Phlash was a lot smaller in person than in the photos I’d seen online. It actually measures just over an inch in diameter and as you can see in the image below is just a bit larger than a quarter. The Phlash is made completely from metal and feels very sturdy. There is also a faint concentric ring pattern on the front and back surfaces and on the button itself which adds a bit of extra grip. The Phlash is powered by 2 lithium coin-type batteries (included) which sit underneath the silver ‘on’ button. To replace them all you need to do is pop-out the button using anything that will fit into the small notch you can see at the bottom. During this ‘procedure’ the button simply hangs off the unit since it’s connected to the rest of the Phlash VIA a small ribbon of cable, making it tough to lose. On 2 batteries the Phlash should supply hundreds of brief flash cycles. There’s a bit of subtle rattle when the Phlash is shaken, but it seems to be the result of the large soft ‘on’ button and the 2 batteries behind it. Other than that the build quality is great and I suspect it would take a lot of pressure or force to damage the unit. It should be pretty safe carried in any pocket. The LED unit on the Phlash is described as “4 exotic emitters embedded in special optics” and I have to say the bulb itself is pretty large. 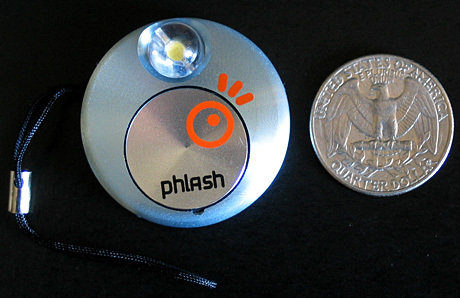 In fact given the overall size of the Phlash itself, the LED is the biggest I’ve seen on a keychain-sized light. Another misconception I had when I’d first seen the Phlash online was that it operated just like a real camera flash does. By that I mean pressing the button fires off a quick burst of intense light. I assumed it was up to the user to ensure that the Phlash button was pressed at the exact same time as the phone’s shutter button in order to get a well exposed photo. In reality the Phlash works just like any other LED light does, remaining on for as long as you hold down the silver button. In hindsight operating this way makes a lot more sense as most cameraphones do some sort of automatic exposure adjustment while the subject is being framed. Having the Phlash turned on during this time ensures the exposure gets properly adjusted before the picture is taken, preventing photos from being blown out or overexposed. The large size of the LED on the Phlash results in a very wide beam of light that is also very uniform which makes it well suited for use as a camera flash. The downside of course is that it doesn’t travel very far. In fact the Phlash’s optimal performance distance is only about 1 meter, or roughly two arms lengths away. Perfect for grabbing a close-up shot of a group of friends but useless for lighting up a singer on a concert stage, even with front-row seats. As a result the Phlash is not really that useful as a key-chain flashlight. While it can light up a pitch-black room enough to safely walk around in, it’s obvious that the Phlash was not specifically designed for this use. The other downside is that the Phlash tends to create a slight blue cast on photos, mostly visible in white areas. But it’s far from a big issue given the overall quality of the pictures being produced by older cameraphones that will need the Phlash. The samples below were taken with a first generation Motorola Razr (with latest firmware) which has no built-in flash. Sure it seems a bit pointless to post the completely black ‘before’ images but I wanted to show that even in the worst lighting conditions the Phlash can still make your phone’s camera usable. With a bit more light to work with I noticed that my phone coupled with the Phlash tended to produce images with a bit more color saturation than images taken in a completely unlit room. Of course this is more a trait of my Razr’s image sensor, but odds are other cameraphones will exhibit the same thing. 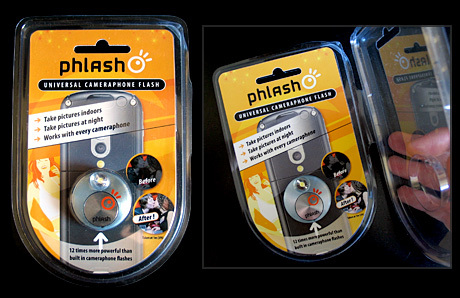 The Phlash Universal Cameraphone Flash does exactly what it was designed and advertised to do. While there is no doubt that a cameraphone with a built-in flash will produce far better results, at $29.99 the Phlash is an economical way to upgrade the quality of photos taken with flashless phones. While some may find having to trigger the phone’s shutter and the Phlash at the same time inconvenient, I think the creators of the Phlash have made it as easy as possible with being able to attach the unit directly to the phone and through the large easy to press ‘on’ button. – Small and easy pocketable, or adhered to your phone of choice. – Well built and very durable. – LED produces a bright, wide, uniform beam perfect for use as a camera flash. – In a pinch can be used as an easily pocketable flashlight. 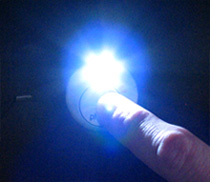 – Some may consider the $29.99 a bit expensive for what is technically a quarter-sized flashlight. – Maximum 1 meter illumination range is a bit limited. – Tends to produce a slight blue cast in photos. – Using the included mounting sticker could leave a residue on your phone when removed. If you have any other questions about the Phlash feel free to drop them in the comments below and I’ll try to answer them as best I can. Pure crap. What sucker would buy this?